Simply put, this is one of the most beautiful Williamsburg jeans ever! Produced in our best-selling Grand Street fit, this is a medium rise jean with ease above the knee and slight taper to the hem. 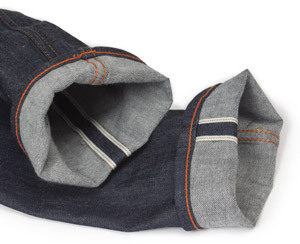 The fabric is a rare deadstock Japanese selvedge made by Kuroki denim with red-line self-edge. There is a modest vintage tint in the white yarns of the fabric, which also has a mildly uneven twill pattern. As you wear and break-in the jeans, the fabric will begin to show beautiful fades which are unique and personal to your daily lifestyle. If you are new to wearing raw denim jeans, make sure to read about care, sizing, growth, shrinkage and aging under the new Raw Denim menu.